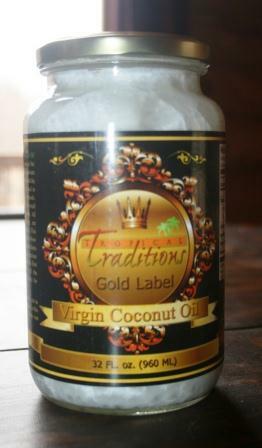 Recently Tropical Traditions sent me a quart of their Gold Label virgin Coconut Oil to try. Having sampled a couple of their other products, I knew that I was in for a treat. I opened my jar and took a whiff and it smelled full of coconut goodness. While perusing the Tropical Traditions recipes for ideas, I was immediately drawn to a recipe for movie popcorn. Seeing as how I basically never get to go to the movies now that I've had kids (and we're on such a tight budget), movie popcorn seemed like the perfect special snack. Supposedly, movie theatres use coconut oil to make their popcorn so tasty! I never knew that. I immediately whipped out our Whirley Pop and put in 3 tbsp. coconut oil plus 1/2 cup of popcorn. 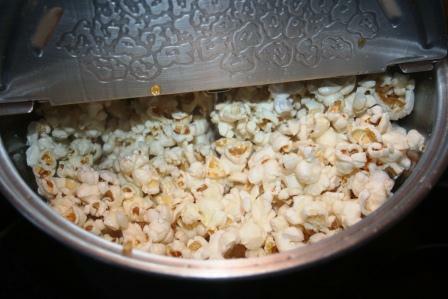 Soon, the smell of popcorn filled the air, and it wasn't the normal smell of when I make popcorn. Oh no, it smelled just like movie popcorn. I kid you not. Following the guidelines of the recipe, I drizzled it with some melted butter and salt after it was popped, and then dished out bowls for myself and the boys. And you know what? It tasted just like movie popcorn. 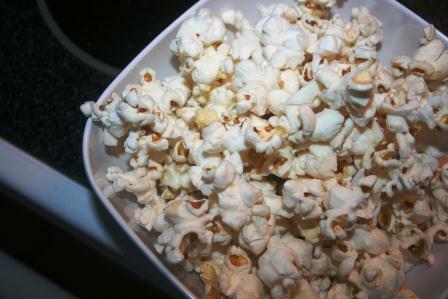 That decadent combination of salt, butter, popcorn and...coconut oil! I confess I ate 3 bowls. Pierce ate 2. We may need an intervention. And yes, we'll be making this again, many, many times again! I can't wait to try coconut oil with more dishes in the future. Want a chance to win some? Click on the "Read More" below my signature to enter! Disclaimer: I received a quart of virgin coconut oil for review purposes. The opinions written above are my own. I love, love love their coconut oil. I want to try the coconut chips too. I have used TT coconut oil for years and did not know that! I am going break out my whirley pop and give it a try! It IS the secret of movie theater popcorn--coconut oil. But I'm not telling my people here because we eat too much popcorn as it is! Going to have to give it a try! You have just brought back some wonderful childhood memories..
My lovely Aunt Mabel made me and my brother popcorn while on holiday in the 1960's.. It was so new to us and a lovely treat.. I didn't know movie theaters used coconut oil! We love popcorn- and now we will need to try coconut oil! Mmmmmmm....popcorn! I wish we could have popcorn, but we are on a diet called: GAPS. So, I will be entering so that we can make our breakfast smoothies! And once we are off of the GAPS diet (which will be in September) we will then try the coconut oil. Thank you for hosting! Oh I would definitely try this popcorn recipes!! I use Coconut Oil in so many of my baking recipes! I'd love to try it for popcorn too. Yum, that sounds sooo good! suebunting1977@gmail.com what I'd make with the coconut oil if I won is popcorn (I love movie theater popcorn, too) and fried coconut shrimp yum! I would like to try this popcorn. I love Coconut, but never thought about having it on Popcorn. I am up for anything. That sounds and I bet taste fantastic. Thanks Lisa! recently looked into coconut oil benefits for my no-one-can-figure-out-what-the-problem-is-but-he's-not-quite-right son so i would love to win! I'd use it in my granola. I never thought to make popcorn with it. I usually use it in baking or frying. I'd drizzle it over chicken breasts and then roll in Panko crumbs to make baked chicken breasts! I love coconut oil! Haven't done any cooking yet but I put it on my crusty feet and it has done wonders! I have also done the hair treatment with it and love it! I got some a few weeks ago and have already gone though half of it! I would love to try this with sweet potato fries! I would make popcorn. I hear there is a drastic difference in flavor. I want to try it in popcorn -- if it tastes like the popcorn in movie theaters, I'll love it! Definetly want to make some coconut macaroons..and use it for baking. And I never knew that they used it for popcorn..and I love to make it the "old fashioned way...popped in a skillet...so I will definetly be trying it this way. YUM! I would try to replace the butter in my pound cake to see how it turns out. I think I would use it to make granola or granola bars! I've been wanting to try baking some cookies with coconut oil. Sounds like it would be good. Thanks for the giveaway!